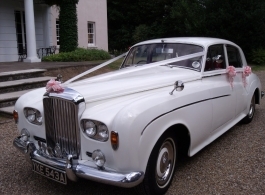 A fabulous Bentley S3 for wedding hire. Truly one of the last real classic cars, this 1960's Bentley is an almost identical car to the series 3 Rolls Royce Silver Cloud. The exterior is Porcelain White in colour with gleaming chrome and whitewall tyres. The large interior is tastefully finished in deep red hide, luxurious wilton carpet and is complemented with a rich walnut veneer. Price also includes flowers, bubbly, colour co-ordinating bows and ribbons.